AMP LIVE’s “Headphone Concerto” is the second solo release for the ZION I producer and his first for Plug Research, with a limited vinyl edition available via Snow Dog. 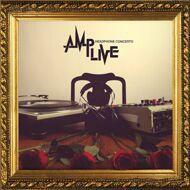 Amp Live has worked with Bassnectar, Fashawn, Myka Nyne, Mike G, Saint Timbre, and has officially remixed Goapele, Underworld, Linkin Park, and done production for Lyrics Born, Dilated Peoples, and Planet Asia. A concerto, only achieved by those who have mastered their craft, takes the audience on a journey in multiple movements through contrast between instruments. Amp Live has has mastered his craft of programming, producing and arranging through his decade of work with his collaborator Zumbi as the acclaimed hip hop duo Zion I, as well as his remix work and previous solo release on San Francisco’s OM Records, and his current affiliation with the EDM-centric Northern Lights Music Festival. Headphone Concerto, Amp’s first release via LA-based Plug Research (Flying Lotus, Bilal, Exile, Sene), draws on his musical experiences of playing drums in his church band as a child, the skater soundtrack he absorbed growing up in suburban Texas, as well as his passion for experimental electronic music that he encountered in the Bay Area after moving there in the late 1990s. This album weaves a mesh between the LA beat scene – Amp is an inspired MPC handler – and California-bred lyrical talent, enlisting emcees Mike G (Odd Future), Opio (Souls Of Mischief), Grouch & Eligh (Living Legends), Planet Asia, as well as up and coming singers (Povi Tamu, Anya & Prof), and utilizes live instruments to a surprising degree (cello, drums), the result being an understated jazzrooted groove that ebbs & flows & flourishes, referencing electronica, indie, neo soul & hip hop, and defying easy classification.